For divorced parents, the first ‘back-to-school’ time can be a little bumpy, but you can prepare for some of the issues your kids may have. 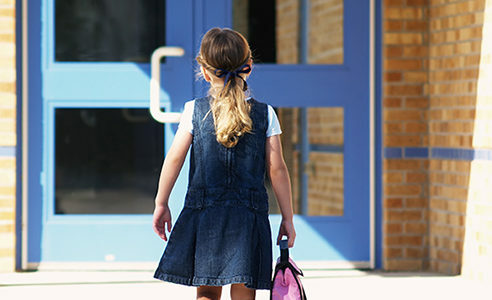 When a child’s world changes so dramatically during summer recess, they may face the new school year with major apprehension. Even well-adjusted children may misbehave, have difficulty sleeping, have nightmares or pretend to be ill in an attempt to avoid facing the new school year. And since children’s worlds revolve around self and parents, they may think the divorce was their fault. So they may set themselves up for plummeting grades in the new school year. 1. Inform the school and teachers. Make sure your child’s teacher is aware of the divorce and any difficulties your child is having. If communication with your ex-spouse is not possible, request that copies of important documents, assignments and notifications be sent to both households. 2.Establish Schedules. Solidify physical custody arrangements so that you, your child, and the other parent are all clear on schedules and routines. Knowing what to expect will lower your child’s anxiety level. 3.Be aware of Unusual Behavior or Attitudes. Look for signs of distress in your child including poor grades, emotional withdrawal, difficulty sleeping, behavior problems, alcohol and drug use, promiscuity, self harm, and suicidal thoughts. If any of the above are present, talk directly with your child, share your concerns with his/her other parent, and seek help with the school guidance counselor or a psychologist if indicated. Finding a good private counselor often gives your child a safe, non-judgmental place to express concerns. Some states require permission from both parents to participate in counseling. 4.Offer Reassurance. Give your child lots of love, reassurance, and support. Encourage them to talk openly about feelings (while making sure not to disparage the other parent). Give him/her lots of hugs and attention. Assure your children that the divorce is not their fault and tell them that they are loved by both parents. Participate in school activities and attend extra curricular activities as often as you can. And make sure that your child spends time with extended family and friends. 5.Create Structure, Offer Guidance. Maintain expectations for school performance and behavior. Set standards for house rules and remind yourself that your job is to love your child as well as teach them how to develop good self-esteem and feelings of responsibility and competence.